Every year thousands of revellers from across the UK and further afield descend on Brighton for the annual Brighton and Hove Gay Pride event which takes place over two days of the first weekend in August each year. The main party takes place from midday to early evening on the Saturday of the event when after the precession of floats make journey’s end at Preston Park, thousands of party goers congregate for one mammoth celebration until 8pm before everyone heads off to the after parties in The Village (Kemptown) or somewhere slightly more risque like Black Rock where sound systems keep everyone entertained well into Sunday. Situated at the front of Preston Park behind the tennis courts as you walk into Pride is The Calabash Tent. A big red and white marquee that moves to the sound of a different drum beat that welcomes both black and white, gay and straight under its canvas awnings. The annual Calabash party at Pride dedicates itself to dance music of “ethnic origin” and has been a firm fixture since 2003 when the tent first appeared as a representative for a previously neglected corner of both ethnic music and ethnic LGBT scenes in Brighton. Not only offering a slightly more diverse musical experience at Pride, Calabash unwittingly serves as a reminder that without the culture that black and especially gay black and ethnic people introduced to the world through disco and earlier strains of house music, the omnipresent sound that many associate Pride with these days may not have grown to be such a prevalent musical aspect of the festival that it is today. 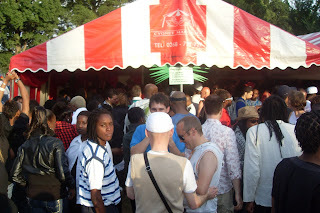 For the resident DJs that play in The Calabash tent and party enthusiasts that congregate each year around them, the history and significant route that ethnic/gay ethnic people have travelled only serves to make the party an event just that slightly more special an occasion to be celebrated and cherished annual at Pride. Within a cultural context it would be inaccurate to describe Calabash as a solely black or ethnic affair because it isn’t and with the theme of acceptance running through Pride’s manifesto, Calabash easily marries colour, creed and sexual orientation in equal numbers. As a spectacle you’re met with a sea of smiling faces, a splash of lush colours including red, gold and green. Palm trees dispersed around the marquee blend with the multi-cultural and mixed race crowd that come to party to the sounds of Soca, Hip Hop, Bhangra, Bashment, Calypso, Reggae, Funk, Disco, Boogie, Ragga, Latin and House. If Pride was a club night then Calabash would be the back room where all the funky music gets played and great times are shared. The team behind each years party make a real effort to generate an atmosphere that is sufficiently removed from the hustle and bustle of what’s happening elsewhere at the main event in Preston Park whilst at the same time continuing the vibrant and optimistic vibe that Pride as a festival undoubtedly has down to a tee. This year (2009) we're delighted to assist in the days festivities as Affy and Ali from Go Bang Brighton are touching down at Calabash from around 5,30 in the evening for a two and a half hour set to finish off the day, a proud moment indeed.